Getting the fact that use of Internet as a medium is at the verge of exponential growth of business in India, so none of the business man can afford to ignore its importance. Internet medium is poised to grow multi fold and in fact has become the most effective medium of communication in Indian market.We at Annexorien Technology help our clients to reach to their targeted customers on the Internet and generate business from Internet medium. 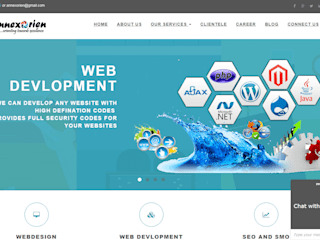 We also help our clients to exploit the advantages of Internet based applications and software, our service include everything that you need for promoting your business online such as web designing, web development, content writing, SEO, SMO, bulk mailing, PPP etc. We visualize being the Internet business partner of all our clients and enable them to reap maximum benefits of Internet medium and grow their business multi-fold in this competitive industry of global world.